I'm actually pretty inclined to take this report with a grain of salt because I can't see Justin Timberlake ever wanting to remind us that there was a time in his life where he looked like this, but Page Six seems to be sure about this, so y'know, here you go. According to them, 'NSYNC — Timberlake and all — are set to reunite at the upcoming MTV Video Music Awards when they're held at Brooklyn's Barclays Center this Sunday. Making this seem more conceivable: Timberlake was always scheduled to perform during the awards ceremony, so it's not too unlikely that producers would try to pull a stunt similar to Beyoncé's Superbowl halftime show — when she reunited with Destiny's Child — in a bid to get ratings. Additionally, adding more fuel to the fire, Page Six reports that Timberlake was spotted in Miami with his former boy band buddies J.C. Chasez, Lance Bass, Joey Fatone, and Chris Kirkpatrick. So, if this does in fact happen, there are a few things we need to get through before moving forward. First off: What song does a band as huge as 'NSYNC perform for their first concert since 2001? Would it be "Bye, Bye, Bye"? "I Want You Back"? "Tearin' Up My Heart"? Secondly: While the thought of this certainly does make preteen-me burst at the seams with giddiness, it'll be important to make sure that this doesn't seem cheesy or forced like a lot of these reunion performances seem to. 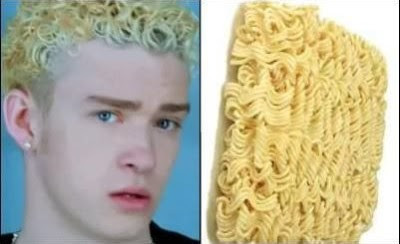 So... Justin Timberlake should probably wear a ramen hair wig, just for the sake of realism.